Unitone ‘D shape’ ear-cup phones. 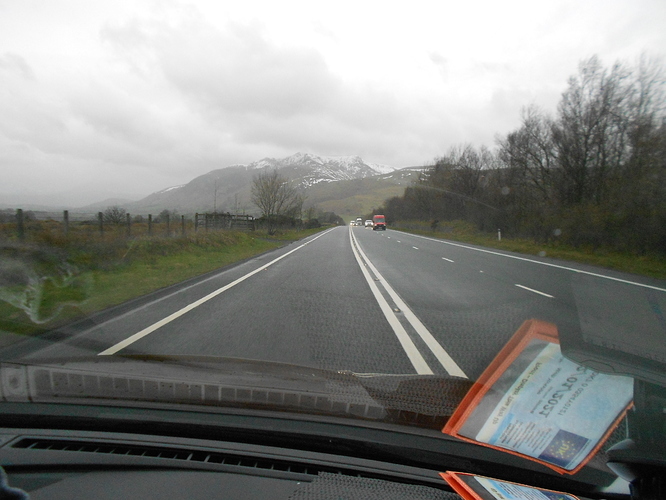 This was the second day of a 4-night stay at the Derwentwater Hotel with my XYL. We picked a bad week with weather forecasts that were really off-putting. In fact at one point I was prepared to write SOTA off altogether but after gritting my teeth and activating Blencathra G/LD-008 on 2m-FM only in cold conditions and high winds, I began to build some confidence. Like 2017, ironically with only three possible walking days available, the day of the drive over was sunny. 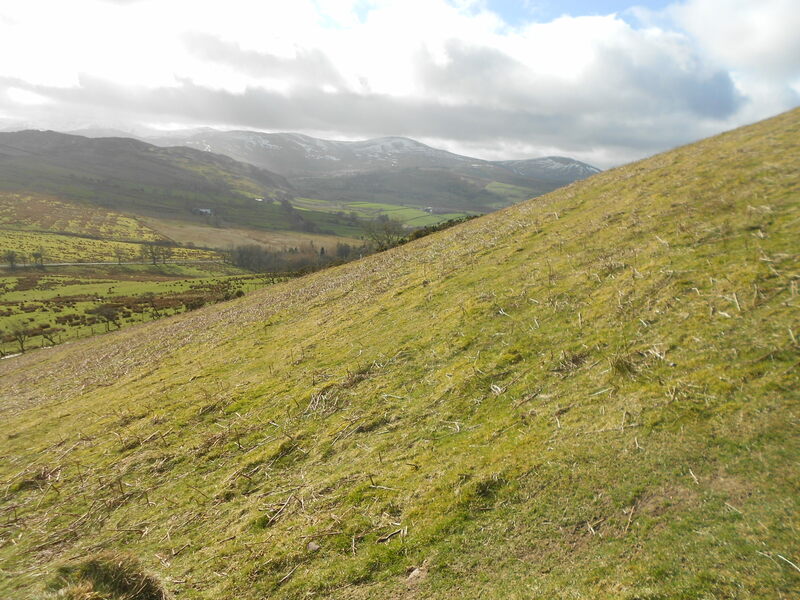 For the second activation I chose the easy option of Little Mell Fell but this time using HF. The only way to survive a long HF multi-band activation in strong winter winds is to have some shelter. 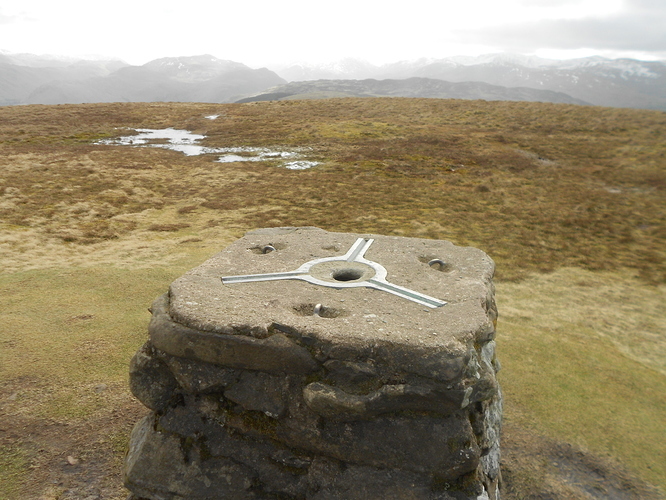 L. Mell Fell has a bare top. 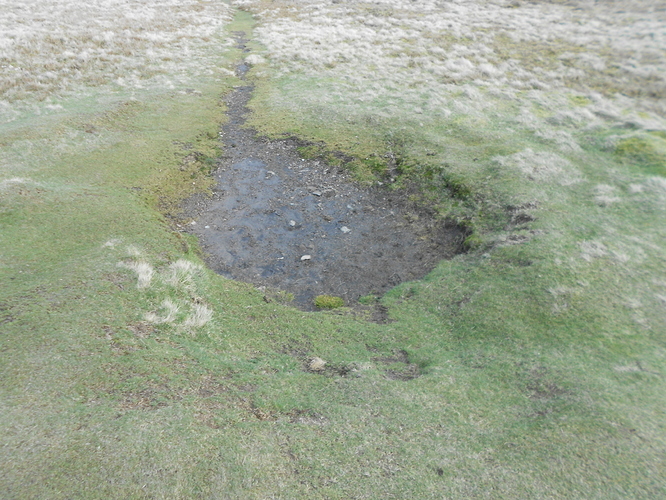 The only ‘shelter’ is topographical or a shallow hole in the ground which is almost always wet. Aside from leaning on the trig point which is not very effective, you have to take your own; in this case a well used ridge tent of 80’s vintage. The tent wasn’t needed; just the fly with pegs and poles attached for ease of pitching. There is space to park a couple of cars at The Hause NY 4234 2353. This is only 500m south of the summit and at an advantageous start height of 380m ASL. 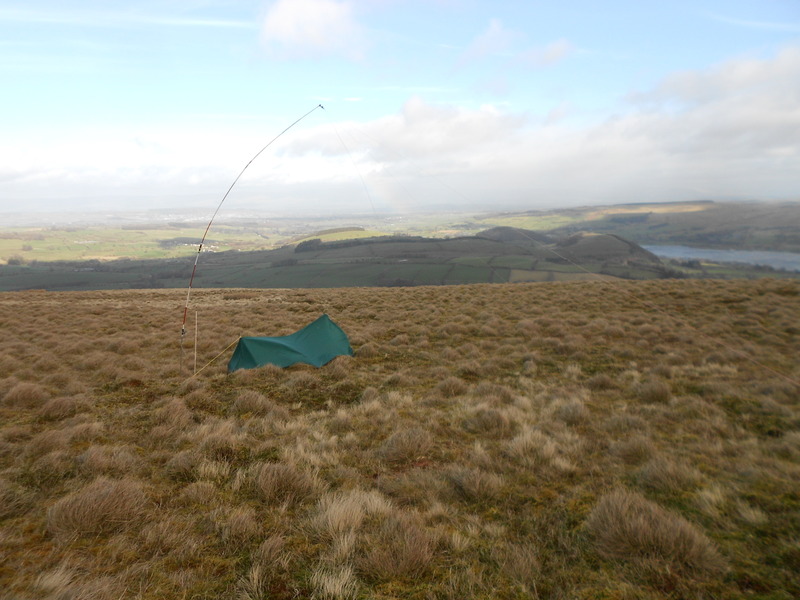 At 505m LD37 is a quick and easy SOTA and an efficient way to earn some winter bonus. 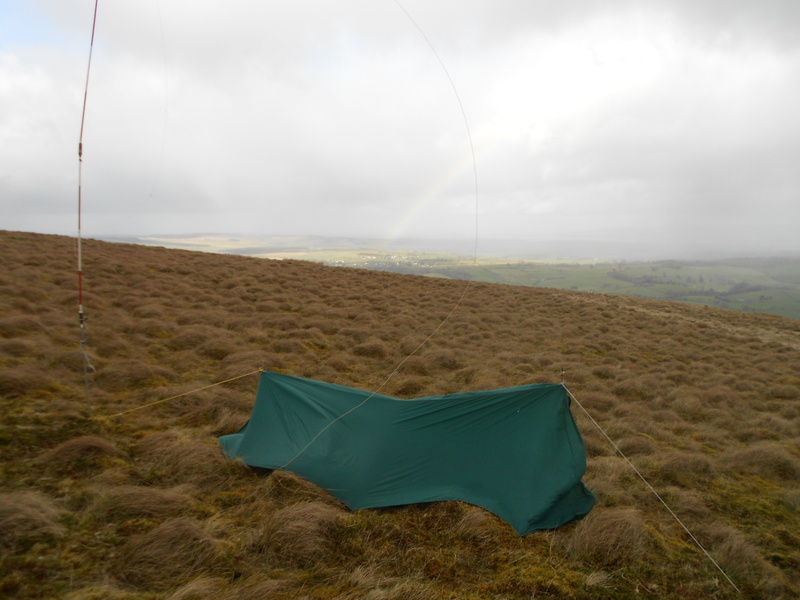 High winds with rain or sleet showers were forecast so I posted an alert subject to getting the tent up. 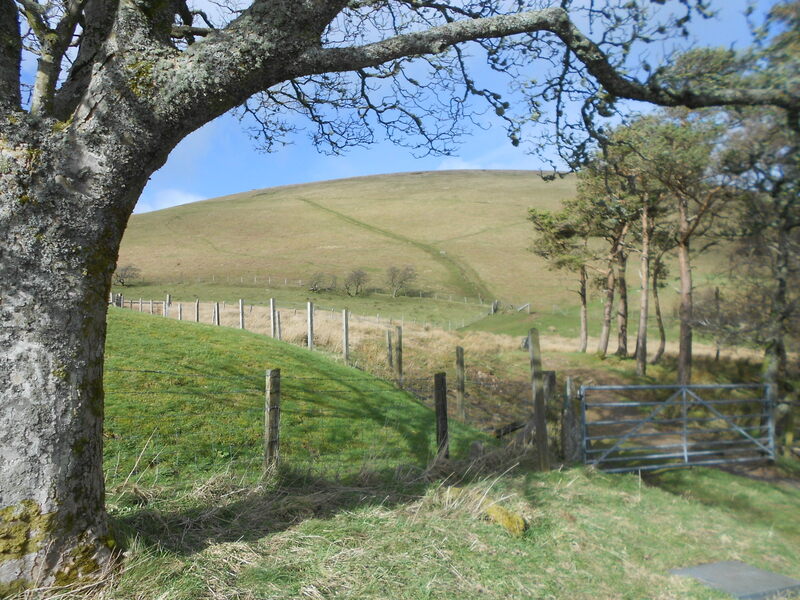 Climb the stile at the road side - NY 4237 2357 and walk the short distance over wet, muddy ground to a second stile. No need to climb it today as the adjacent gate was open. Go steeply straight up to join a transverse path where you turn left at NY 4234 2371. Go along here for a short distance to turn right - NY 4226 2380 on a new path which goes straight up to the trig at NY 4233 2402. I set off walking in sunshine at 14:04. The ascent took 13 minutes to the trig including some pauses for breath and photos. 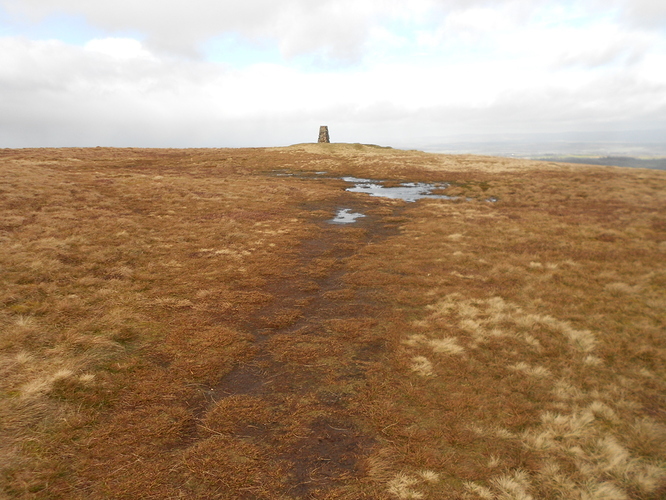 LITTLE MELL FELL, G/LD-037, 505m, 2 pts, 14:17 to 16:47. 6 deg C. 35 mph westerly wind with occasional rain showers. Early sunshine with good visibility but murky in showers. One episode of severe precipitation static at 15:20. IO84NO, WAB: NY42 Trig: TP4447. Vodafone mobile phone coverage. Walking down the slope a short distance in an easterly direction, the tent went up without too much trouble. Care was needed if injury from flailing fabric and attached pegs was to be avoided. 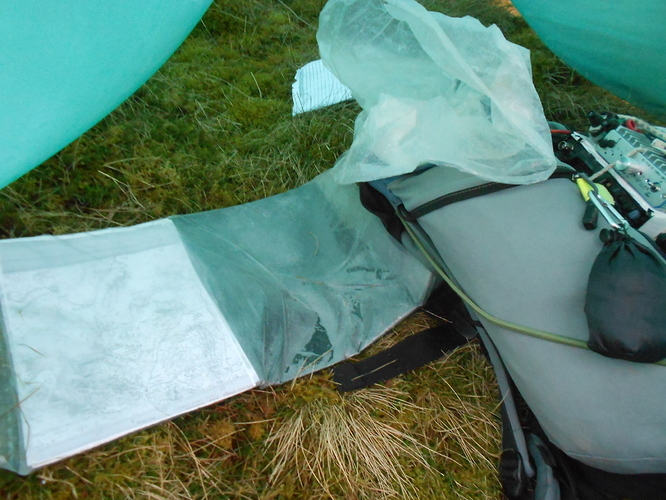 This is a relatively easy tent to erect singlehanded in strong winds if the low end is pitched first and into wind. The ground wasn’t frozen at all but the grass is quite thick and springy, making it difficult for short pegs to contact actual soil. Even so, no pegs were ripped out by the wind for the duration. The dipole went up easily enough too, the mast doubling as a rear tent peg… However, this antenna system uses no guys so the two radiating legs finished at a sizeable included angle to compensate for the strong wind. It was clear that the word had got round and I heard Phil G7AFM talking to Keith G4BYY. Portable stations were mentioned and I assumed one was me. All this made for a quick start which is always welcome when you’re on a summit. Phil passed me efficiently down the list which expanded several times before the end. In the log: G7AFM Phil WAB controller; G0BFJ Brian; MM3PDM/M Peter; EI2KD Rod; G0FEX Ken; GW0WAB; MI7JMN John; G4BYY Keith; G0RQL Don; G4WSB Bill; GM6ZAK Andy; M6VWX Graham; PA3DIP CJD; GB1ABG op Dave G4IAR; G0TDM John; G6LKB Dave; G0VWP Terry; G8ADD Brian; GI4TAJ Joe ; G4OOE Nick; GW0PLP Don; G4AFI Andy; MM0XPZ Steve and GI0TAK Ray in Portadown. Only a few stations were coming in below 57 to 59 but several struggled with my signal until after working 11 ops, I discovered that I hadn’t switched the linear amp on. Even then like a fool I switched it on and announced this to everybody before noticing that the circuit breaker feeding it was pulled. Once this error was rectified things became a little easier and the stations who hadn’t received their report now returned to make a successful QSO. SOTA friend and fellow SARS member Dave G3TQQ (Pickering) called in and gave me a 21 report. I tried several times with Phil helping but Dave faded our before the QSO was completed. He was so weak that I didn’t hear him at first but Phil did. Another casualty was 2W0FLW Derek who was a good 58 to me but failed to hear my report to him. Power was 5 Watts for the first eleven and 50 Watts after that. These stations were worked in just over half an hour. After listening on 80m from the mobile the day before, I was left with the impression that the band was in poor nick. It wasn’t poor today however. At the end of this session the rain arrived and with it a sudden and quite severe dose of precipitation static which wiped everybody off the band as far as I was concerned except Phil G7AFM who I could just make out. Phil was clarifying a p;point about book numbers, explaining to (I think) Dave G6LKB that along with the club call book number of 11,000, he could also claim my (G4YSS’s) book numbers of 7664 and 17664. The QSY to CW was kindly spotted on Sotawatch for me by Rod EI2KD (disguised as EI7GAB) so there were stations waiting on 80m CW when I arrived; a great help. Stations Worked: G4WSB Bill 2x 599; ON4VT Dan 599/ 559; G0TDM 599/ 559 John; G4TPJ 2 x 599; G4AZS Adrian 579/ 559. Power was 50W and these QSO’s were logged in 8 minutes. This QSY required a dipole link change, done quickly in wind borne drizzle. Immediately my self spot took effect I was called by K4MF Gary in Florida. This always takes me by surprise. Being mainly a 160-80-40 SOTA op, I am not used to working outside Europe and the USA callsigns are so unfamiliar I often have to ask for repeats. Next in: G0TDM John in Penrith; N4EX Rich in North Carolina; K0RS Larry in Colorado! ; EA8/ PA7ZEE Geert in Gran Canaria and the final caller II9IGB Antonio in Sicily and who’s callsign I slightly mangled. John was 599, as you’d expect six miles away but Larry’s signal was just about up there too. For the others and I gave out 559 to 579. Both Rich and Geert were struggling with my signal resulting in 329 reports and the other overseas stations all gave me 559. Power was 50 Watts and this session took just over 10 minutes. After a QSY spot via my phone I worked John G0TDM at 59 both ways but for some reason, further 50 Watt CQ’s went unanswered. This did give the opportunity however for John to pass a message from Geoff G4WHA, who was looking forward to a QSO on 2m. Since there was nothing further on 20m I set up the 2m vertical on top of the front tent pole. In fact it wasn’t truly vertical and that may have been significant later. At 16:12 I called John G0TDM with 5 Watts from the FT817ND. Geoff G4WHA/M had been primed by text and was ready in the car outside his work place. I could hear Geoff calling and instantly knew that making a QSO would be difficult or impossible. I was only getting him 52 on the meter and he would be using 50 Watts to my 5. Furthermore he would likely be in a suburban location. 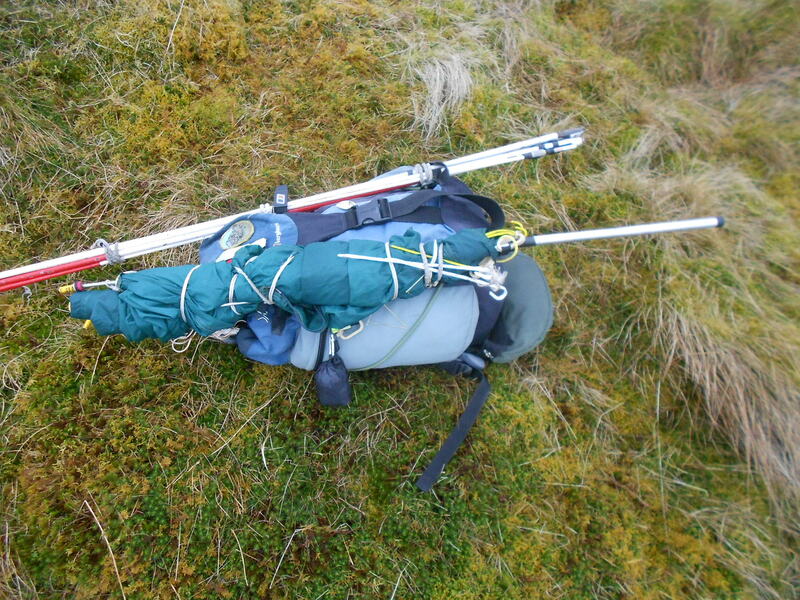 After several tries I suddenly thought about the VHF mobile rig I slipped into the rucksack at the last minute. The thinking was that if I couldn’t get the tent up in the wind I could try 2m-FM with 25 Watts from the hole near the trig. I wouldn’t have that luxury on a ‘normal’ summit but this was a little ‘un and therefore conducive to carrying a big load. John couldn’t hear him but I could hear Geoff was close to giving up the quest but it was just a case of dragging the rig from the pack and swapping the 5Ah battery and aerial onto it from the 817. I was now calling with 25 Watts and this time I got a ‘31’ from Geoff. He’d heard me but minutes later it was looking like another failure until I did as John had suggested and stood outside holding the antenna as high as I could, in the rain as it happened but we didn’t bother about that. At last Geoff got the 55 report I was giving him and QSL’d it. Good contact! Geoff had missed about 20 minutes of work so I guess he would have to make it up later. However glee was heard from the other end and I felt good about it too. A worthy close to the proceedings and a good job I’d brought HF as there were no further takers on 145 despite a spot by John. Last time I packed up here it was pitch black and snowing but today only the wind was a menace. It didn’t take long in spite of extra work with the tent but I didn’t begrudge that; it had protected me well. The descent took 9 minutes to 16:56 and the first thing I did was to switch on 3.760. A QSO on there kept me company on the 25 minute drive back to Portinscale. I think it was Dave in Wellington, Shropshire but I don’t remember the callsign. Might have been G8V?? and he was talking to a GD. Another successful SOTA session but with a completely different feel to Blencathra’s snowy challenge. Next a bath. 125m (410ft) of ascent / 2 x 0.7km (0.9 miles) walked. I never thought I’d be writing one report dedicated entirely to Little Mell Fell, let alone a second. 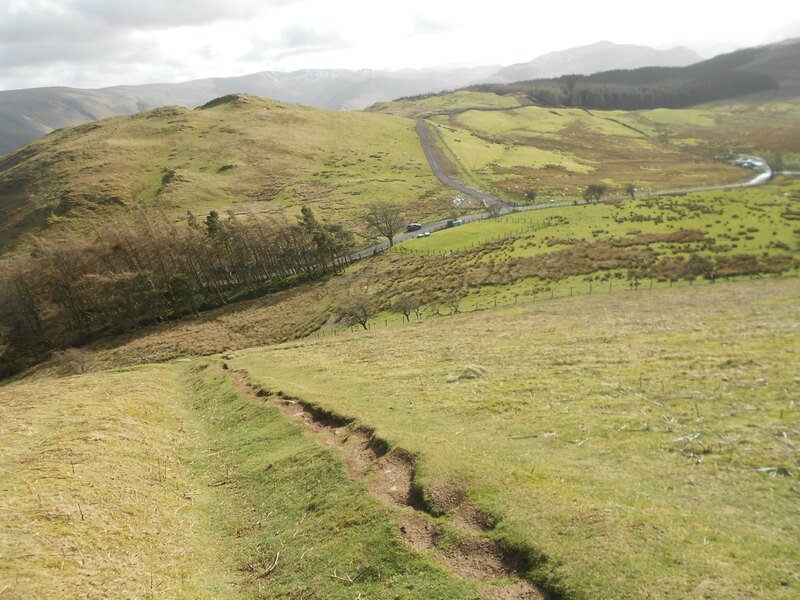 This hill used to come at the beginning or end of a series of multiple activations. In this case it filled in an afternoon nicely, allowing time to try out the café in Portinscale with the XYL in the morning for tea and scones. 80m had been quiet over the last couple of days but this activation livened it up alright. I was pleased by the response and moreover by the efficiency of Phil G7AFM in his role of net controller. I got a lot of stations logged in quick time thanks to WAB. Conditions on 80 were not exceptional but they must have been pretty good if I logged 11 QSO’s accidentally with 5 Watts. 20m was a great choice too. I didn’t expect EA8 and I wasn’t banking on the USA either, especially Colorado. SSB failed again on here. Strange? The weather was a bit onerous but once erected the tent tamed it, though I did get rapped on the knuckles a few times with thrashing door closure clasps. I’ve always struggled to make 4 QSO’s on 2m-FM from LD37 but I think that the days of relying on VHF from this hill are well and truly behind us. Only the stalwart friends John and Geoff turned up today and it proved impossible to work Geoff with 5 Watts. Even 25W was pushing it so anybody reading this who’s thinking of putting on Little Mell Fell, bring HF or if it’s VHF, big power, a beam and a means to spot. Geoff G4WHA/A & John G0TDM have to be congratulated again. Thanks for your support and good company. To all stations worked and spotters: EI2KD Rod and G0TDM John. Also Andy’s phone ap SOTA spotter. Above: The ‘Bacon saver’ for Geoff G4WHA/M. The diminutive 25W VHF mobile rig. Above: GLD-037. Ready for off. Above: Driving west along A66. Blencathra G/LD-008. A significantly higher snowline than 24 hours prior. It sure looks winde man! Must have been perfect with that tarp/ tent. That was a very interesting contact we made when you were on Little Mell Fell! Thank you for all your efforts. I was more than happy to have a no contact and for you to either go QRT or give up completely. I have worked that summit from my car at Carlisle before so it was stange to struggle so much. However these things happen. Out of 136 chases of LD-037 this was the hardest. Again many thanks for your perserverance. Hope the weather is kinder on Knott but from what i remember of that summit which was done in mist i dont think there is much shelter either. It was a difficult contact and I can’t understand why but you remember those and forget the easy ones. I was not right at the trig but down east of it a little way for the westerly wind. Maybe I got in a bad spot for VHF. 136 chases. My goodness good to tell it’s on your doorstep! Weather was very similar on Knott. Same high wind and rain showers but I was comfortable enough once I got the flysheet up. Report to come but won’t be today I fear. In contrast to LD37, you were armchair copy on LD23 today! Just a 2W ‘top-pocket’ H/H and duck delivered easily. It was a big part of choosing that one. Not too far to drive, 6 points, fewer than average activations, especially on HF and overlooks both Penrith and Carlisle. A success but there wasn’t time to go back to 2m at the end. Thanks Geoff and John too. Don’t know what LD activators would do without you two! Not just saying that myself. It’s based on what others say including my SOTA colleagues in Scarborough. I’ll never know where a ‘W’ came from but I will correct it. Thanks also for today’s QSO (LD23/ NY23) with the special calls both yourself and Tony. I knew who it was when he gave his name but I forgot his callsign at the time. He’s a big name in WAB like yourself. I felt a bit bad today. I should have gone off to one side and let the trig point on. I think Andy was probably colder than I was and his log sheet apparently did a runner. On the plus side there were only a couple more to work after I worked him. Phil G7AFM did a good job for me yesterday and today. Much appreciated. Many thanks for another excellent report John. 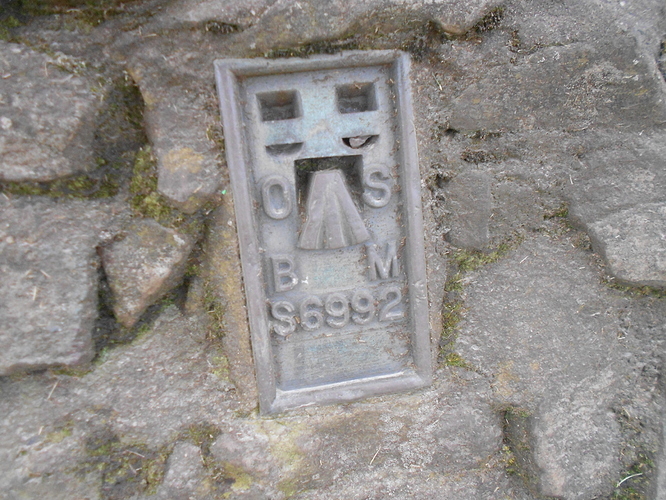 A simple summit, but very exposed as you say. The tent was an excellent idea. I recall that Paul and I were pleased to get some hot soup down after our activation. Funny how such things stick in the mind! Hi John, just for the record, Geert was in Gran Canaria operating as EA8/PA7ZEE and not EA9. Thanks Andy, Thought you’d agree! Two of the best. Geert was quite weak with me and 559 was generous. At first I got ZEE, then his home call but I later heard an oblique stroke. Next I thought - well more like assumed I heard ‘HB9/’ so I had HB9/PA7ZEE in the log. 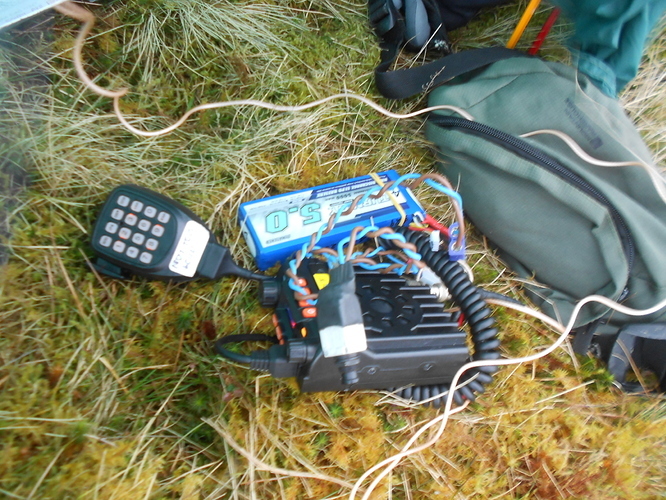 Good job Geert kept on correcting me but I thought I ended up with EA9/ which puzzled me as I have never heard it from a SOTA op and maybe never heard it full stop. I wasn’t that confident because I know that Geert likes the Canary Isles so thank you very much for clarifying that point for me. That’s how the error developed, helped along by poor band condx and my mediocre Morse reading skills. I will make a correction in due course but fortunately I have yet to get round to the database. Thanks again for putting me right. Much appreciated as I like to be accurate where ever possible. Also thanks for the 80m QSO Victor.